We carry a rainbow of solid tea towels and also some ticking and checkered styles as well. Tea towels are a great way to get crafty. I whipped up a few aprons with some beautiful blue tea towels we have in stock. Supplies needed: tea towel, few yards of ribbon, some stitch witchery, matching thread and a bit of fabric for embellishment. Version one: I just stitched ribbon to the top of the towel and gave myself some extra for ties. The bottom is just a strip of the same ribbon. I pre pressed the ribbon in place with my favorite time saver stitch witchery, no pinning just a bit of steam and a quick run through the sewing machine. Version two: I simply folded over the top of the towel, stitched a channel to feed my tie through. The embellishment is just and eighth of a yard of fabric top stitched. I think these are a great addition to the kitchen when you have helpers around you can make them feel more comfortable and official with an apron. I like to give tea towels away as hostess gifts. This apron would also be a great gift for any occasion. This is a flour sack tea towel embellished with scraps and a little embroidery. 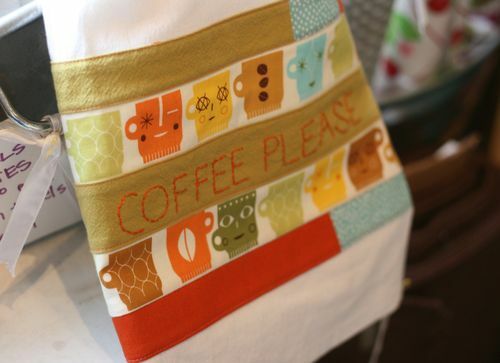 We also carry tea toweling by the yard, those can be used as tea towels, napkins or table runners. I could see some cute aprons made out of these as well. Here is a great post from our archives on napkins made with tea toweling by the yard. A fresh shipment arrived this week of toweling by the yard, also Oregon / Washington state tea towels.